The guided cycle will cover the 280km over 4 days (with 4 nights accommodation). There are no rest days. Post-finish accommodation is not included but can be arranged on request. 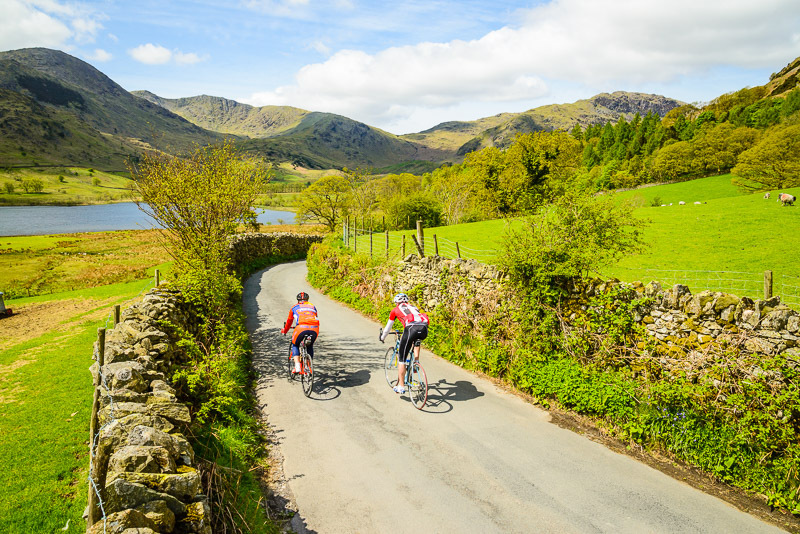 You will need to have a good level of cycling fitness and stamina to cope with the profile and possible adverse weather conditions that multi-day cycling through the Lake District, Yorkshire Dales and North York Moors encounters. It will be an average of 70km each day for 4 days in succession and so you should have completed two back-to-back half-day cycles prior to this holiday of comparable distance/terrain. The price per person for the Guided Cycle Package is £525.00. (Post-finish accommodation and single rooms are optional extras). Dinners to be paid for locally. You will be staying in our personally selected and high quality, friendly accommodations with secure storage for your bike. We curate a great range of country inns, guest houses, farmhouses and small family-run hotels for your trip, each visited by our team to ensure excellence. Delicious filling breakfasts are included with your stay. Our drivers travel the route each day on a consistent and reliable schedule moving your bag with care and professionalism from accommodation to accommodation, always ensuring it is there by 4pm (and often much earlier depending on location along the route). If you are coming to England as part of a longer holiday and have items you do not need for the Coast to Coast, we can store them safely and securely in our office for the duration of your trip and then drop off at your final accommodation. If you are unfortunately unable to cycle on certain days due to injury or illness, our knowledgeable and friendly drivers will be there to pick you up with your bags and drop you off at your next accommodation, providing local insight along the driven route. We have a secure (locked) car-park at our operating base in Kirkby Stephen, where you can leave your car for the whole duration of your trip. We will then transport you and your bike to the start in St Bees and bring you back from Robin Hood’s Bay. You can also access your car when you pass through Kirkby Stephen. If you need assistance or advice on anything related to your trip then we will happily help and can arrange for you. For example, finding train tickets from the airport, hotels in Manchester, and taxis from Robin Hood’s Bay (purchases are all additional expenses). We have written and produced a comprehensive guide to your Coast to Coast Holiday covering all the things you should need to know to prepare and pack for your trip. It also includes details of what to expect and look out for along the way and the services to be found in each village (such as cash points, banks, shops etc), as well as the times to expect your bag(s) to be picked up and delivered each day. We supply you with the gpx file of the route if you have an appropriate navigation device. We’re available 7 days a week and not just in office hours to help you with any query or request either prior to or during your wonderful trip. Don’t forget we are the only local and the only specialist Coast to Coast holiday provider. Meaning we can freely give you any insights into the route, we will meet you as you pass through, we can even look outside our window to tell you exactly what the ground conditions are like and what the weather is doing. Allow around £20 – £25 per person for a two-course meal. Your appetite may change along the route as you adapt to the challenges and you may have special requirements, which is why we avoid choosing your lunches for you. As with evening meals, there are often many great local options to choose from and in any case your accommodations can provide a packed lunch (which you simply order on arrival). Allow around £5-£7pp for a full packed lunch including sandwich, snacks and drink. Life circumstances can unfortunately occur and so we always advise you have suitable cover including cancellation. This is advisable even if you are a UK resident. You may also want to purchase snacks and souvenirs along the route. For all local purchases we advise carrying cash as some of the smaller locations may not accept card/contactless payments. Please remember your bag weight limit if purchasing souvenirs along the way. These are not included (as we presume you will want to ride your own). We can facilitate bike hire should you require (from Dales Biking Centre).